How does your mind symbolize heat? A roaring fire, perhaps? Expand it out a little. What else is there? Smoke? How about visualizing pressure, mass, or form? Enter into the experience of visualizing visualizing (whoa, meta!) 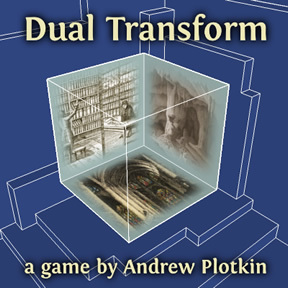 in the CGDC7 award-winning interactive fiction title Dual Transform by Andrew Plotkin. Take on the role of a virtual engineer, of sorts, feeling the pressure of really making this project something to remember... something that really feels real. Dual Transform is a game about a metasemanticity—so I guess this review makes me a metametasemantician. Your character designs virtual workspaces of some kind, and you've got a deadline to meet, but you've hit something of a block. You've got to think outside the box by going inside the box, or the cube, to be more precise. Like most works of interactive fiction, you use a text parser to interact with the game. Use your keyboard to input text commands, such as l/look, x/examine, get, drop, i/inv/inventory, and so on. The game is a bit more abstract than your typical "west of house" interactive fiction title, however. Because of the nature of your work as the lead character, you'll have to be a bit more clever with your actions. Make sure to examine your environment and pay close attention to the way the game describes objects; often, the game will nudge you through its descriptions towards the actions you'll need to perform. Collect bits of data, for example, and, once they've been compiled, place the icons into your workspace to see what evolves from them. Dual Transform is anything but standard in concept, and figuring out what it wants from you can be a bit of a challenge at first. Analysis: Dual Transform would not be the best introductory game for someone new to IF. Not only is there no tutorial, there isn't a help menu, nor does the game contain any hints about puzzle solving. You need to already be familiar with IF logic, in which you must scan the paragraphs of text for clues as to which aspects of the scene are important and how to interact with them. As you progress, your environment changes around you, forcing you to keep examining new things... especially your inventory. The best part of the game is in exploring your environment. You'll really cheat yourself if you just try to solve everything as quickly as possible. Take the time to look at everything. This isn't one of those IF games where the description says "You enter the room. The grass is covered with flowers. Wow, so many flowers. You can't stop looking at the beautiful, magnificent, amazing flowers," yet when you try "examine flowers" you get the response "There's nothing like that here." If Dual Transform mentions something, you can look at it, and the evocative descriptions make that worthwhile. The parser is also excellent. You don't have to hold its hand and type "drop the Mr. Key's House Of Keys key on the key chomping device." You can be precise if you want to, of course, but the game is smart enough to figure out what you want from some pretty terse commands. The connection with the "escape" theme is a bit of a stretch, but I can't really go into that further without ruining the surprise of the ending. Let's just say that what goes on in the game could deal with some interpretation, and I'd love to hear yours in the comments. Whatever conclusions you draw, Dual Transform is a cleverly written piece of interactive fiction that challenges you to be creative with your environment to succeed. Is there any way to take icons out of the workspace? At the end my virtual world shatters into nothing and I'm trapped. Is that the only ending, or is there a better ending? This is the most fun I've ever had with IF! (AND the descendants of IF.) This beats WoW cold! I wish each room was larger, though. If each area was a world, or even just a large facility of some sort -- an entire cathedral, or a field next to a forest bounded by a stone fence -- this kind of thing could go anywhere! But you'd need a college physics prof as a consultant. This concept rocks. This game has MASSIVE potential. I'm telling Mensa about this. This game reminds me of a book I once read -- "The Talisman" by Stephen King & Peter Straub. Very clever, but (fortunately) not too clever for me! My one problem was that at the very beginning I had no idea what to do. The opening description says that "the equation is hanging there in the workspace". It was not at all obvious that "get equation" followed by "put equation in workspace" would equate to anything other than a no-op. but I don't know how. Help? It seems like the game slows down as I play...I think it's because of the buildup of old text. Is there a way to clear the screen without refreshing the page? Have you tried filling the flask in the laboratory? Take the chalice from the church (pressure) and fill it water from the cave (light), then pour it into the flask. it takes forever for it to processs my commands, esp if it actually accomplishes something or I switch rooms. This is really hindering my enjoyment. Got to what I think is the final area, decided to save, and it refreshed. Reloading the page does nothing now. The game is just ... gone? If I try to reload the page, it very briefly says Parchment Loading or something, and then nothing. All I can do is start over completely from the beginning. VERY DISAPPOINTING! 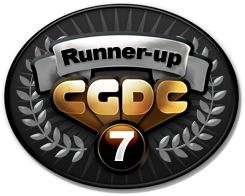 A game-ending bug that close to the (presumed) conclusion? Also "( the silver key)" kept popping up, but probably unrelated. One another note: I found an odd glitch-like bug thing when I tried to sit down. Encased in spoilers just to shorten it. Upon dropping the item and sitting again, it gave me the message: "What do you want to sit [illegal object number 3135]? ", though with those greater-than less-than signs, rather than brackets. A tad odd, but it hasn't hindered my game thus far. Interesting mechanics in an IF game. Very well done, throughly enjoyable. The "illegal object" errors are a bug in Parchment, the interpreter, not in my game. (It can happen in any I7 game that's sufficiently large.) Annoyingly, I *found* the bug, but fixing it uncovers a worse bug, so it can't be fixed immediately. At any rate, the bug is harmless -- it's just misprinting a word. If the game is playing slowly, or if you run into other interpreter bugs, you can download the game file and play on a Z-code interpreter such as Zoom or Gargoyle. I'm stuck... can anyone help? I just got the weight icon. Got a tree in the heat space and a tree stained glass window in pressure. Know they are connected to the bookcase with tree engravings in the weight space, but can't figure out anything to do! I only understood you as far as wanting to e the glass flask. & now I don't know what to do next. Does anyone have any suggestions? ...but from that point I'm still stuck. Get the axe from the light room, then use it to break the stained glass window. This will open the bookcase. spycat811 - e is short for east, which is a verb, so you just got the parser a bit confused. I actually really loved this game. It's the first one I've played of the comp winners, but it seemed a great example of a casual piece of IF - not too hard or too long (certainly compared to some of Plotkin's other stuff) but involved enough to give you a sense of accomplishment when you get to the end - assuming that was the end! This is probably the first game in AGES I've gotten through without resorting to a walkthrough. Beautifully written, excellent puzzles -- it made me think hard without pushing me to the point of exasperation. The endgame is wonderfully clever. Well done! Broke the stained glass window in the church before trying to do anything else in the library. Woo! Finally won the game! To be continued? To Be Continued??? TO BE CONTINUED??!?!!! D: Aw, man! Sequel! Now! so I left and when I came back it was gone? Am I just blind or is this a glitch? left your inventory that it transformed. In the form room. Dropped the item and it turned into the moon. Examined the taller stone and the character doesn't know which direction is which. I've been through the other rooms and nothing has changed. What am I missing? Really fascinating game. One of my favorite pieces of IF for sure. Try making a list of everything the transforming object turns into. Have you used everything on the list? Have you examined the compass? Have you examined it in every room? Once the compass transforms into a glowing moth you just go from room to room forcing it to change shape. Each room poses a different threat to different objects. Very cool stuff. 5/5 and a bookmark for future playing. At the beginning, I didn't understand anything.. but, right now, I think I've finished this game. (Please, don't take this spoiler if you haven't all forces). When I take the exit of the room, the work space crash and send me to a blank space where I can't do anything except reload the game.... Is the finish of the game?? Looked up metasemasi... metasimanticism, erm... metisemantism, meta... ah, that weird word, just to figure out what exactly this game was about. And encased in spoilers for brevity. metalanguage: a language that can be used to describe languages. meta-: pertaining to a level above or beyond. semantics: the study of meaning. archetype original: something that serves as a model or a basis for making copies. Conclude what you will from these; my first conclusion was that the results of my last IQ tests were wrong, and I must retake it as soon as I finish this post. The second is that I am playing as a developer coding a kind of simulation that rigidly adheres to the very basic laws of physics, the fundamental principles that makes everything work; none of that fakety-fake rubbish, you know. Pressure was symbolized by the Church. Pressure to do good, I suppose? The game itself was just fine. With less random choices for you to try out, most things being quite straightforward (go to this room, use item on the object), it was quite a somewhat easier than most Interactive Fictions. As far as gameplay, writing, puzzles; Was rather so-so, but the subject was intriguing. without destroying the whole room. The contraption in the laboratory has a flask above it which can be filled. Was going to write a walk-through of sorts... but got lazy. Perhaps later. does anyone have a walkthrough? Finally finished it. I was amused at the different forms of the single object, especially at the form space. I had the feeling that the workspace would break down or something, because of the increasing difficulty of the character in placing the icons, and the increased activity of the workspace. Wonderful. i just had a hard time unlocking the padlock. turning it into the silver key. the game comments constantly about the presence of gusts of Air, and often says Air with a capital "A." Maybe that was an intentional red herring, but after all that build-up I would have liked to do more with Air than just blow a smoke ring at it. All in all this is a solid game and I look forward to a sequel. before I had unlocked that room, and it still took me to it! stars in the form sky but I'm stuck there. Any help? This was reminiscent of Infocom's Spellbreaker with its elemental cubes. Try hugging the tree. Doesn't get you too far but it sure is comforting.